Here’s a delicious new take on chicken salad. The chicken is poached in white wine to be tender and flavorful. Find fresh greens and an assortment of colorful veggies to add to your salad, don’t limit yourself to the ingredients listed below. Something magical happens when you poach chicken in wine and the serve it over a bed of vibrant produce…try it and see! 1. Place the broth, wine, onions, garlic and thyme in a large pot over medium heat. Bring the mixture to a boil, then gently add the chicken breasts one at a time. The chicken should be fully covered by the liquid, add more broth if needed. Return to a boil. 2. Once the liquid boils, turn off the heat and cover the pot. Allow the chicken to poach for 30 minutes, then use a slotted spoon to remove the chicken and onions from the liquid. Once cool enough to handle, shred the chicken and slice the onions. Combine the chicken and onion in a bowl and generously season with freshly cracked sea salt and black pepper. 3. 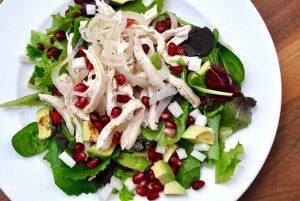 On each salad plate arrange a bed of mixed greens and top with pomegranate seeds, pepitas, jicama, avocado and a scoop of the chicken. Drizzle with Classic Balsamic Dressing and serve immediately. The chicken will keep up to 3 days in the fridge. Enjoy! Bob Thomson is a Personal Trainer, boot camp instructor and weight loss expert specializing in total body and health transformations. Utilizing many years experience in the field of fitness, nutrition and peak performance, Bob has helped dozens of clients lose weight, get fit and healthy and squeeze the juice out of life.